Violonist Francesca Dego, who has just released her sixth album, "Suite Italienne", graduated from the Milan Conservatory. She later continued her studies with Salvatore Accardo at the Chigiana Academy in Siena, where she also studied under Itzak Rashkovsky from the Royal College of Music in London and Shlomo Mintz. Born in the 1980's, Francesca Dego is half of an Italian violin-piano duo with her contemporary, pianist Francesca Leonardi. The two have been very successful across Europe. 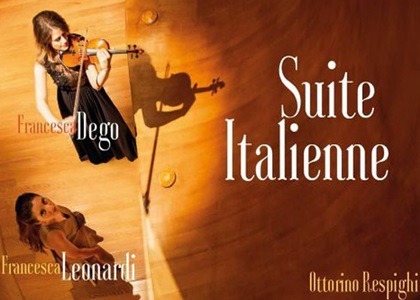 In their last album, released under the record label Deutsche Grammophone on 12th of October 2018, the two artists present a recital of Italian music from the beginning of the 20th century, namely scores by Ottorino Respighi and Mario Castelnuovo-Tedesco, as well as the Suite Italienne by Igor Stravinsky. The pinnacle of this album are the four pieces written by Mario Castelnuovo-Tedesco, three of which have been recorded for the first time on this occasion. The opening score of this recital is Respighi's Sonata in B Minor, composed after the symphonic poem the "Fountains of Rome" (1917). It is represents the neo-romantic opus that encompasses the whole spectrum of human emotions. Francesca Dego thoroughly takes responsibility and impeccably expresses the intonation, telling a story with mysterious ramifications, all the while maintaining a confident, reserved attitude. Due to his temperamental nature, Ottorino Respighi might not seem the most suitable composer for violinist Francesca Dego, who successfully recorded all of Ludwig van Beethoven's sonatas for piano and violin with pianist Francesca Leonardi. Also noteworthy are the generous melodic lines and the very complex rhetorical feature of the piano parts, performed beautifully by Leonardi. The recording of Tedesco's Ballade op. 104 for Violin and Piano is a premiere and it is considered to be the peak of this album. The ballade was first performed in 1940 by Tossy Spivakovsky, and it has been kept in the Tedesco family archive ever since. With the help of the composer's granddaughter, Dego manages to turn the audience's attention to a piece inspired by Chopin's ballades and shaped accordingly to the twentieth century. The two artists amaze the audience with a performance laden with emotive spur and great finesse. They seek to promote the music of this composer, exiled from Italy because of the strictness of the fascist regime at the time. With the same reasoning, Stravinsky's Suite Italienne was included; the neo-classical score inspired by Pergolesi's music, which is another opus that highlights this beautiful and strong collaboration between the two artists, Dego and Leonardi. Their compatibility is evident, as they are both on this refined streak of interpretation that is fluid and perfectly articulated, thus gaining the chameleonic characteristic of the musical discourse: sometimes acidic, sometimes arched towards ….melodic lines. The ending of the album is also dedicated to Mario Castelnuovo-Tedesco - a series of his adaptations of famous themes from masterpieces such as: Gioachino Rossini's Rosina and Figaro Duet from The Barber of Seville and Giuseppe Verdi's Violeta from La traviata. The harmonies are modern as well as they are "spicy" - so as to quote Mario Castelnuovo-Tedesco. The composer's humour is as noticeable as the level of virtuosity of the interpreter, a challenge Francesca Dego takes upon herself without hesitation with accuracy, confidence and ease. These musical pieces are like fireworks that end a true celebration - a remarkable recital by two exceptional Italian musicians, who will surely continue to shine in the competitive world of classical music.